It's Monday, the weekend is over, which means that the Frolic is over, which makes me a little bit sad. I love going to the DKC Knitter's Frolic. 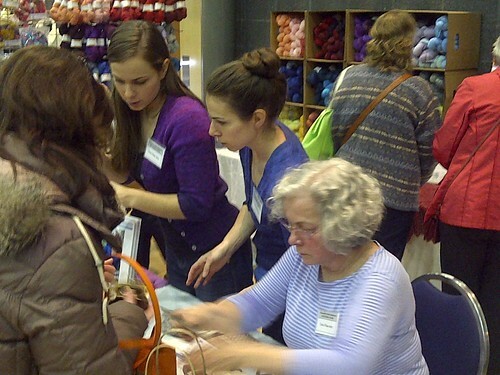 Seeing familiar faces, meeting new knitters, it's fun. It's months of work that all boils down to one long drive from Montreal to Toronto on Friday, one insanely busy Saturday surrounded by awesome yarn, and then it's over in a flash. Me, Lilia and Mom working hard! Rovings, Orange Label and lace oh my! After the chaos of the weekend I've decided to take the rest of the day off to bake cookies and then eat cookies. As you read this Chris and I have piled all of our yarns into one very large rented econo-van and are driving down the 401. Next stop... Knitter's Frolic! So excited. We're bringing more than ever this year. 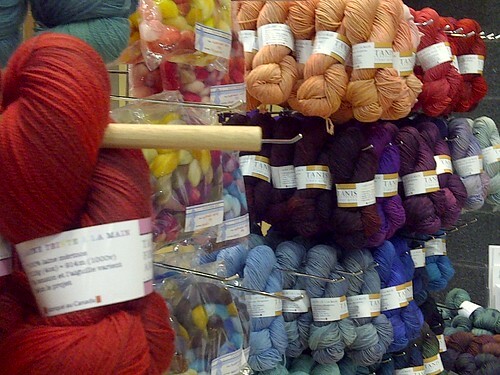 The booth will be bursting at the seams with colourful yarn. Lilia and Mom will be there helping. With any luck Julie and her new baby(!!!) will be making an appearance. There is just so much to look forward to. I used to get really stressed around show time, but now that I'm used to the chaos I look forward to it all. The plan is for Chris do stay busy doing some live tweeting during the show, check us out on Twitter for to the minute Frolic excitement. Say it with me now: Aaaaaaw! 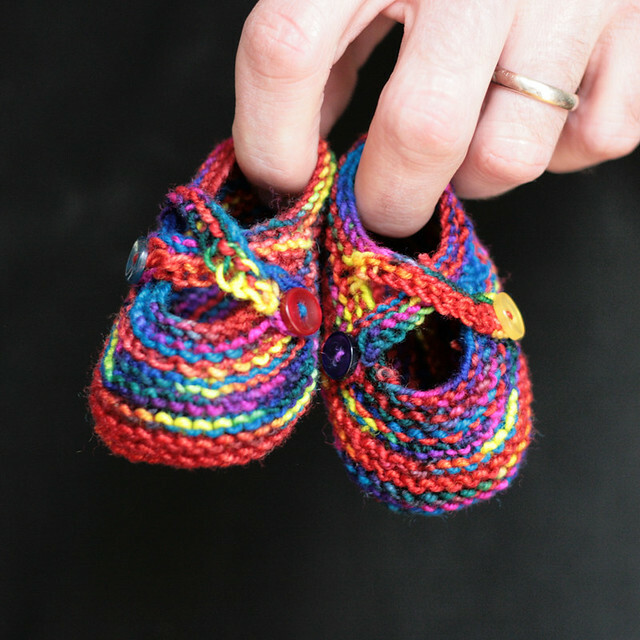 Saartje's booties in some crazy leftover sock yarn. Amazing. Raveled. My French Braid Cardigan pattern is now available and I could not be more excited about it! As far as pattern writing goes, I stayed the course with this one and managed to knock it out in much less time than it usually takes me. I had a very clear vision of what I wanted this cardigan to be right off the bat, when it wasn't working out just right, I ripped and re-knit until I got it! I'm very pleased with it and have been wearing it a lot ever since I cast off. If you ask me, spring time is actually the perfect season to knit yourself a lovely layering piece like this because since the weather is starting to warm up you don't have to cover up all your gorgeous hand knits with a big winter coat! I've been wearing mine instead of a jacket lately and it feels so good to shed that heavy winter layer. 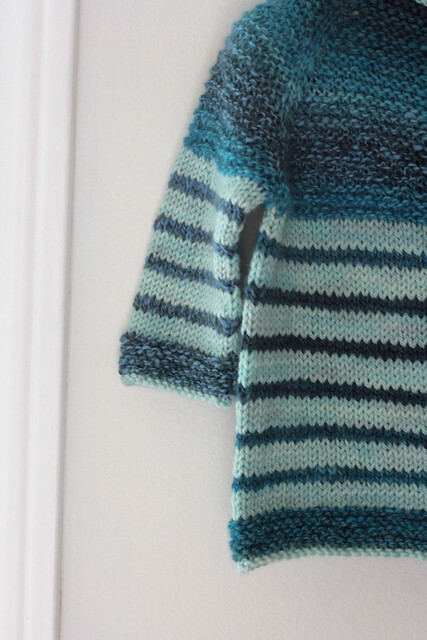 This sweater is knit from the top down in one piece with almost no finishing required. The swooping cable panel that runs around the neck and down the fronts adds a really flattering line to an other wise casually fitting sweater. This sweater definitely earns it's name with the french braid cable detailing down the front, on the sleeves and down the back. I knit this sample in my new Frost colourway and am crazy for it! Yarn: 6 (6, 7, 7, 8, 8, 9, 10) skeins Tanis Fiber Arts Green Label Aran Weight yarn 115g (4oz) = 187m (205yds) sample shown in Frost. 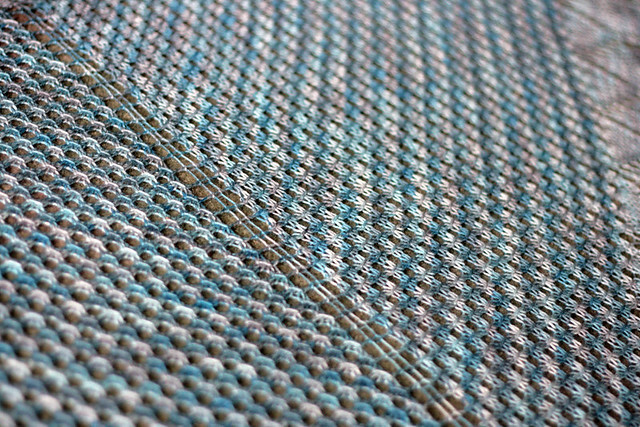 Gauge: 18 sts and 25 rows in 4” in stockinette stitch. Additional Tools and Materials: Stitch markers in 2 different colours (4 colour A and 6 colour B), waste yarn or stitch holders, tapestry needle, crochet hook. More details on my website here. Every time I finish a wee little baby sweater I block it, sew on the buttons and I think to myself: "This is it, this is the cutest little thing I've ever seen. I can't possibly knit anything any sweeter." But eventually I cast on for another little sweater and I end up feeling exactly the same way about it. This little guy is no exception. I'm gaga over it. The handspun paired with Frost DK. 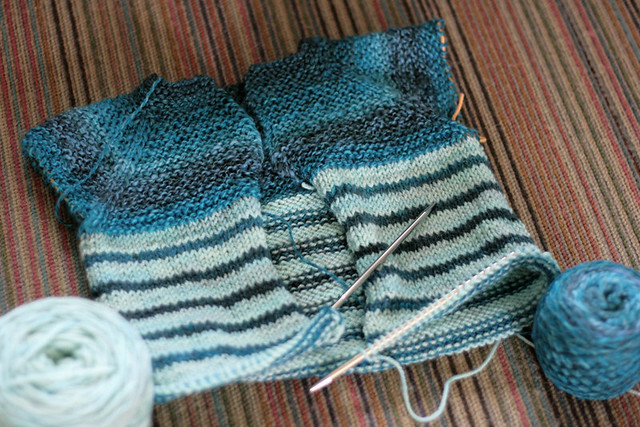 The contrasting colour bind off on all the hems. Those perfect buttons that look like they have glimmering drops of water on them. Sigh... it's almost too much. Knitting this sweater made me realize how much I love handspun yarn. It never disappoints. So full of texture and intrigue. I think I might carve out a bit of time this weekend to do some more spinning. Wishing you all a wonderful weekend. I hope to spend mine spinning, knitting, cleaning out my garden and generally chillaxing. 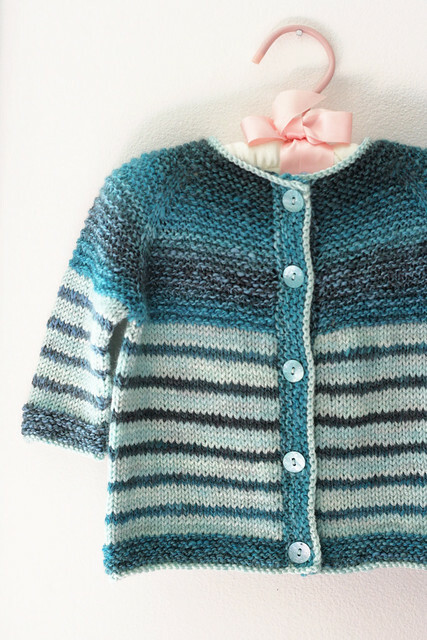 Pattern: Garter Yoke Baby Jacket by Jennifer Hoel. 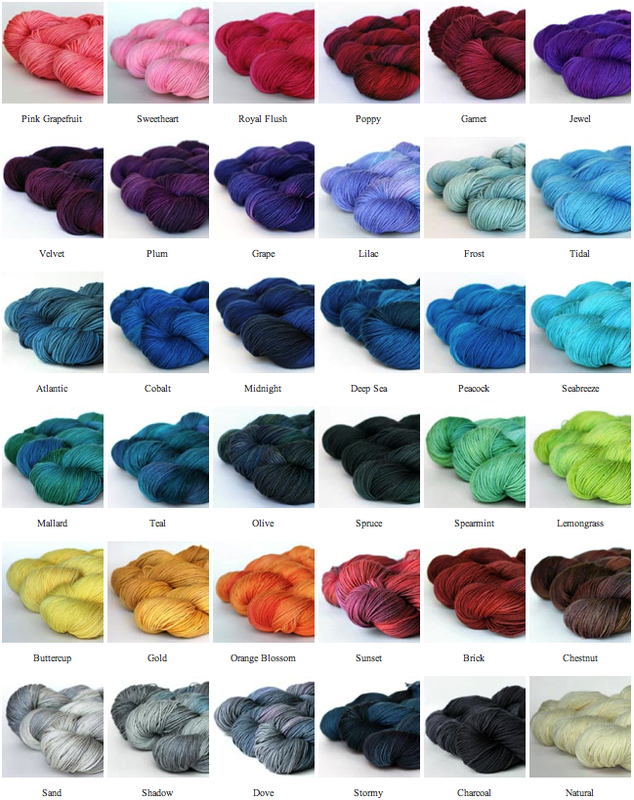 One of my favourite pages on my website has always been the colourways page (let's get real, isn't the colourways page the best part about any yarn website?) In my website re-vamp project I knew that I wanted to tackle this page and take it up a notch. I think that these new photo's show off all of the colourways better, and overall, the whole thing is just makes me so happy. And speaking of awesome rainbows of colour... introducing my new and improved TFA Palettes! The Palettes are essentially the Baby Shane Blanket kits, just re-named to promote more inventive uses. 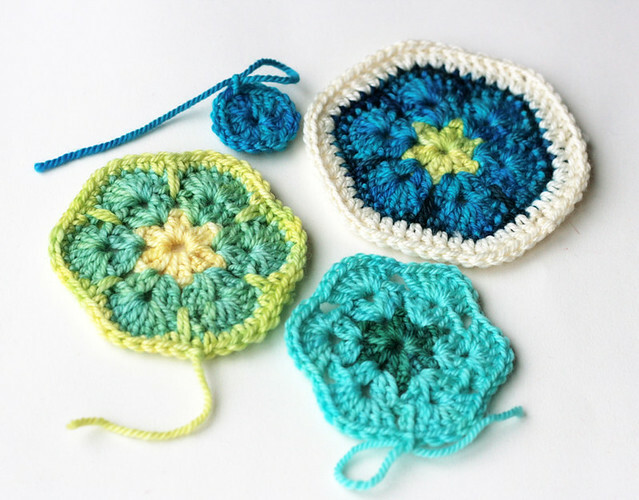 In the past, I've grabbed a Baby Shane Blanket kit several times, intending to use the yarn other projects. This, this and this all borrowed from the kits. 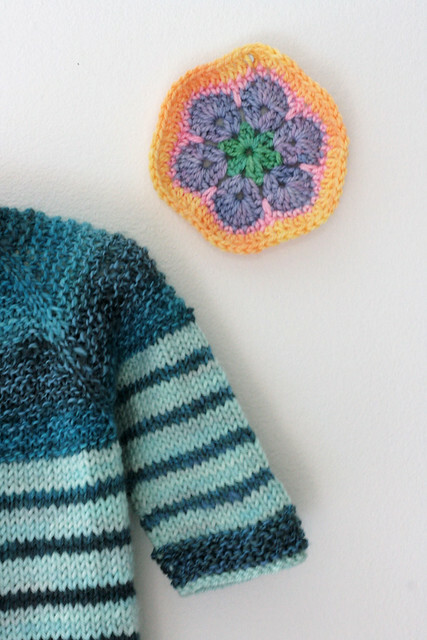 They include the perfect amount of yarn to knit just about any awesome, colourful, baby blanket pattern, but I also love the idea of scooping up your favorite Palette and using the yarns to knit several smaller projects (maybe a few striped kid sweaters? 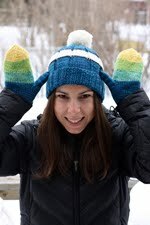 Hats or mitts for everyone on your Christmas list?) 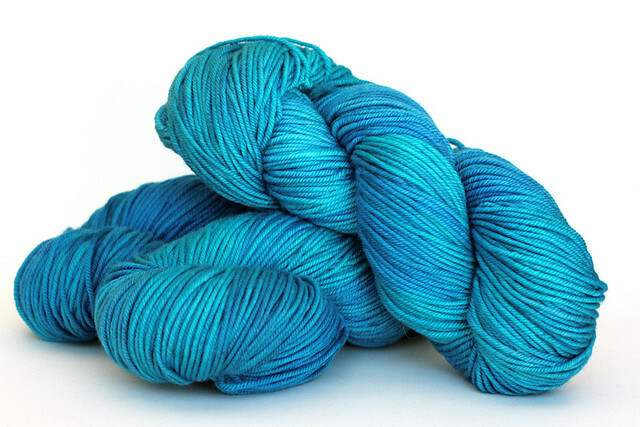 I view them as a way to try out 8 different colours of TFA yarn, without having to dish out the dough for 8 full skeins. 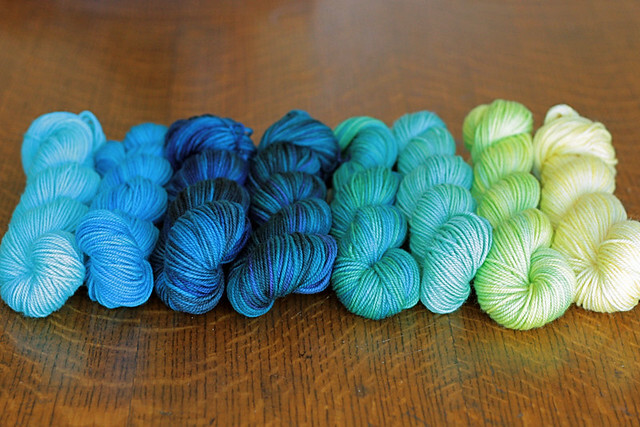 Because I'm so excited about these new Palettes I plan on working them into an upcoming colour driven KAL! Stay tuned for all the details. I haven't worked it all out just yet, but I'm thinking that the general idea will be to challenge yourself with a colour project. You don't need to buy a Palette to participate, I know that lots of you have great TFA stashes to work from, however, I'm thinking there should be a prize for most inventive use of a TFA Palette. I'm considering tackling a rainbow sweater myself! 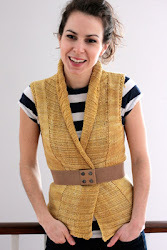 You've been seeing bits of this vest for months now, and I'm finally ready to share the pattern with you. I could not be more excited about this! 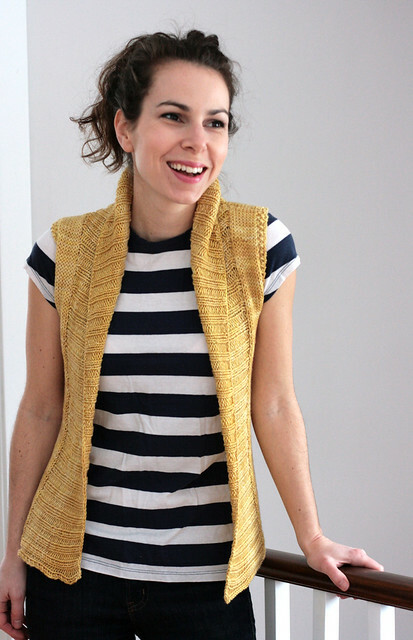 The Honeytree Vest is a classic, simple vest with almost no finishing. It uses a few precious skeins of my new Orange Label Chasmere/Silk Worsted weight yarn. A sweater in this yarn would be amazing, but because of the luxury fiber content its on the pricier side of my yarn collection, so I wanted to offer a more reasonable pattern option. A vest is just the ticket! This vest can be thrown on with anything, belted, pinned, or simply left hanging open. It's a quick knit, and done in this stunning yarn it packs a lot of punch! Yarn: 3 (3, 4, 4, 5, 5, 5, 6, 6, 6) skeins Tanis Fiber Arts Orange Label Cashmere/Silk Worsted Weight yarn, sample shown in Gold. Needles: 5mm (U.S. 8) 32 inch circular needle. Piece is knit flat and then sts are picked up around the front for the band and collar. Additional Tools and Materials: stitch marker, tapestry needle. I'm really excited about this pattern because I think that its a classic wardrobe staple. It's a great transitional piece that can be worn all year long. 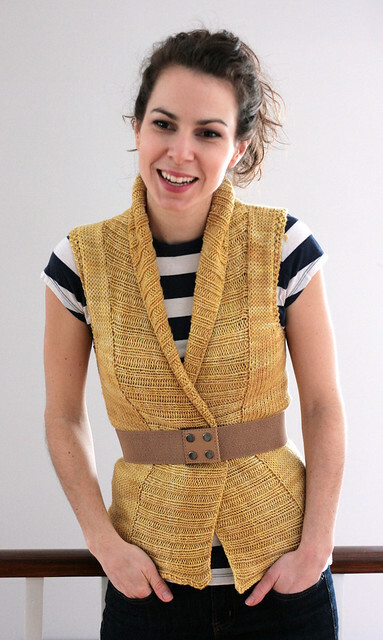 I love designing knits that get a lot of wear, and I hope that if you knit this vest you'll find yourself wearing it all the time. The new Orange Label Cashmere/Silk Worsted weight yarn is now available in my shop in all of my 36 colourways. 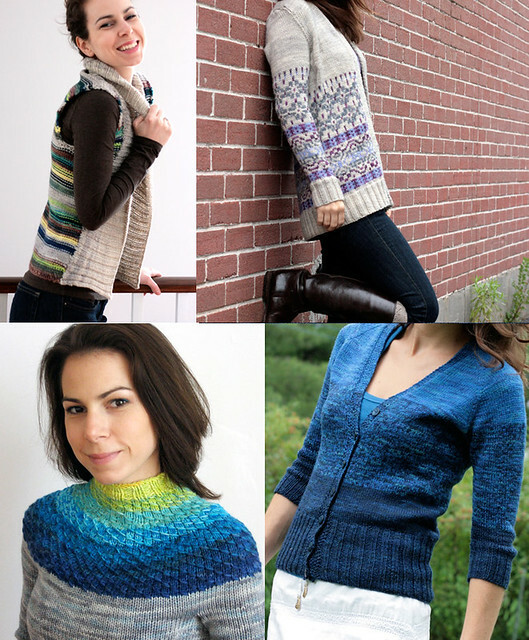 I will have printed copies of the Honeytree Vest pattern and plenty of Orange Label yarn with me at the DKC Knitter's Frolic at the end of the month. 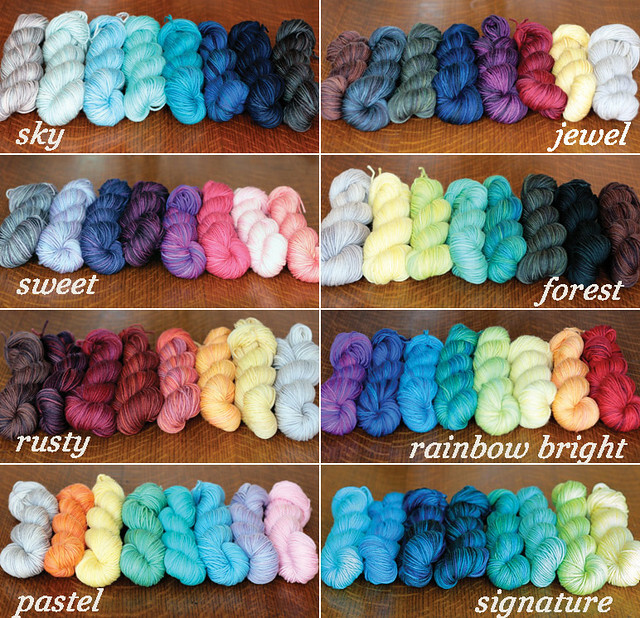 The yarn has been added to Ravelry, I highly recommend checking that link, is there anything better than a yarn rainbow? Can you see the sheen of the silk shining through those skeins of Peacock Orange Label? Delish! Here's one last parting collage just because I couldn't help myself! I've blogged these photo's before, but I just can't get enough that that silly whippet face! Can you spot the updates? Spent the majority of the weekend updating the website with a new yarn, new colours, new patterns, new palettes, new photo's, new layouts... can you spot all the updates? Of course I'll be introducing you to all that's new with great pomp and circumstance over the coming week, but for now I wanted to pop in and give you a little nudge to go take a look around and let me know what you think! Today is Tanis's birthday! 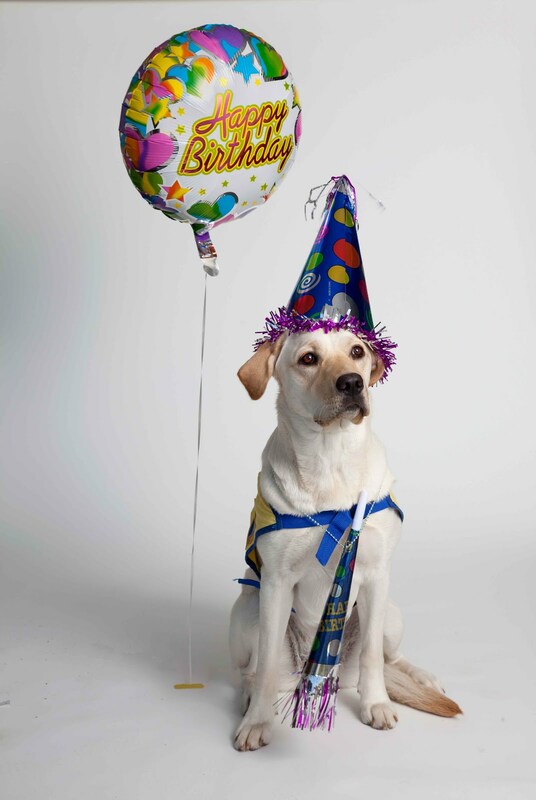 !Let's all wish her an amazing, awesome day of birthday fun. 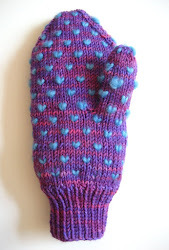 I recently read this blog post by Jane Richmond about why she likes to knit socks. I couldn't agree more with everything she says. However, I'm fining that recently, knitting baby sweaters hits all the same targets for me as socks do. 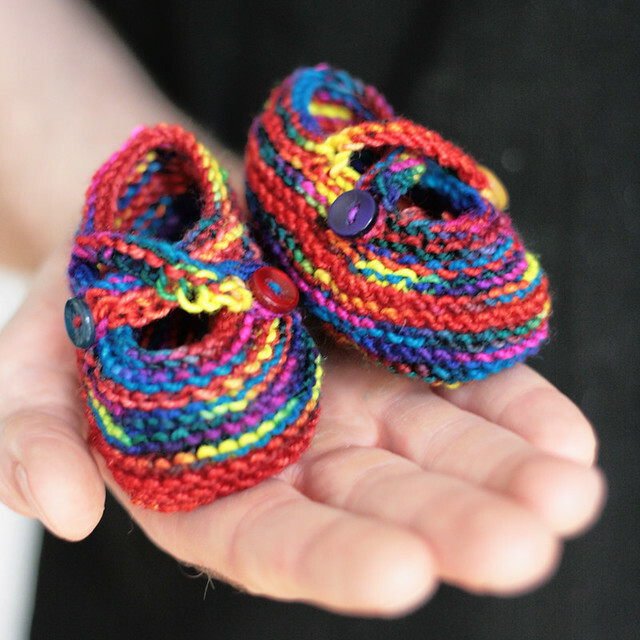 They can be small, portable, mindless, they don't really have to fit, they can be knit with just a single skein of yarn if you want. Best part is they are always adorable, no matter how simple the pattern. I'm currently working on a little number that has the added satisfaction of using up a very special skein of handspun yarn. I really do love spinning, but I treasure my handspun skeins so much that it can be really difficult to find a project worthy of one! I spun this skein way back in November 2009 and have been hoarding it ever since. I love the way it's working up so far. 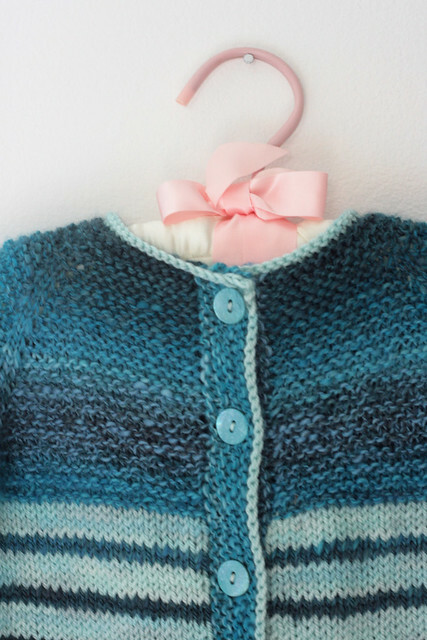 The pattern is the Garter Yoke Baby Cardi by Jennifer Hoel. 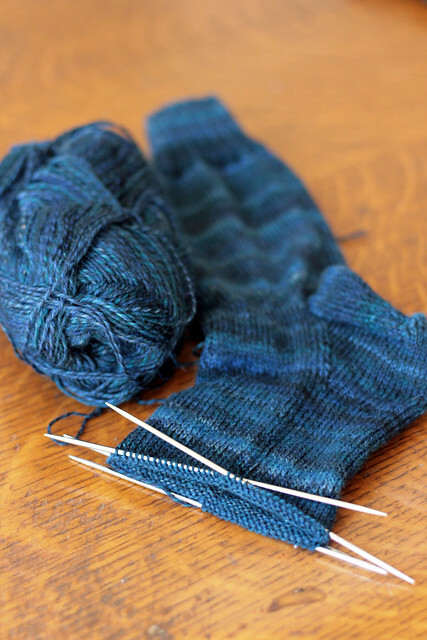 Of course, having said all that, I still have a pair of simple stockinette socks on the needles just in case. 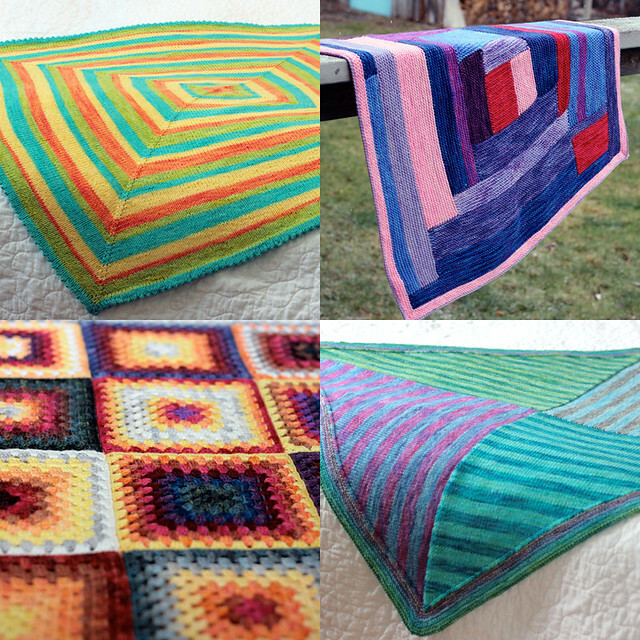 In an effort to refresh my Baby Shane Blanket kit palettes I started playing around with colour, and not surprisingly, came up with this collection of shades that I am always drawn to. I've used a similar palette here, here and here. I just can't seem to get enough of this blue, turquoise and green combination. 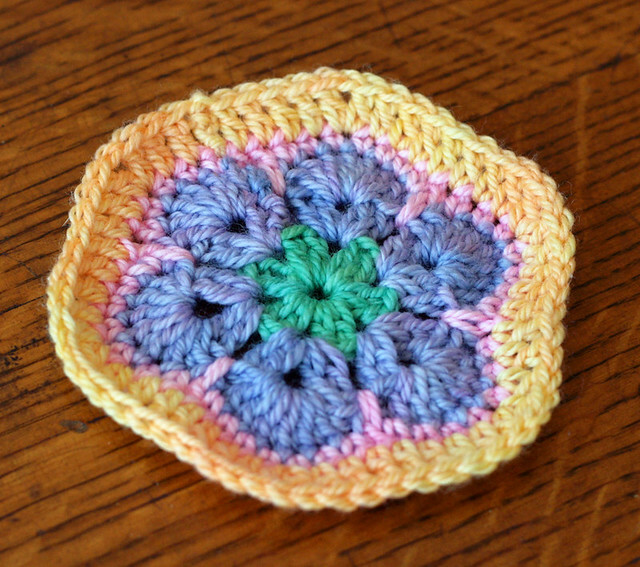 After the success of my first African Flower Hexagon I just couldn't fight the urge to cast on for a few more in my signature palette. I now have a stack of about 50 hexagons... I'm not quite certain what they will become, but I love them. 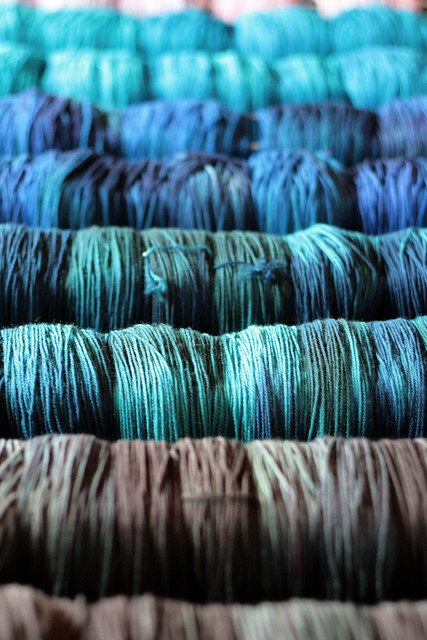 It's not uncommon for me to glance over at the racks of yarn drying in my office, and be surprised by a beautiful palette of colours lined up next to each other. I never get tired of it, though it happens all the time. Yesterday it was this rack of blue yarns, Stormy, Teal, Cobalt, Peacock and Shadow (way in the back, barely visible in the photo) you know how I feel about shades of blue, this just made my day. I'm working away at several designs at the moment. 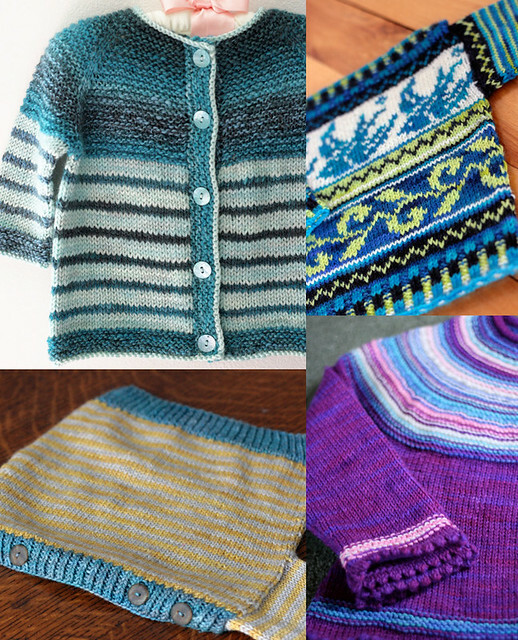 It's funny to look back and see the shift that has occurred in my knitting life. When I think of knitting now it's completely intertwined with designing. It wasn't always that way for me, but over the past year I've noticed a subtle shift. When I feel like casting on for something new, it's rarely a new pattern that I've found online, but rather a new design idea that I've had floating around in my head and can't wait to work out with yarn and needles. I learn a lot about my design aesthetic and my design methods with each new piece I work on. One thing that I know for sure is that for me, knitting is definitely part of my design process. It may seem obvious, but its not the case for everyone. 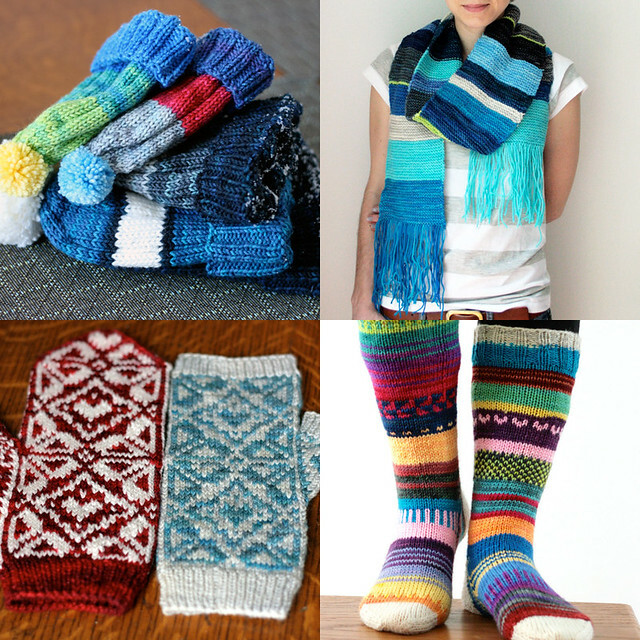 Some people can visualize the pattern, do some swatching, write it all out and send it off to a test knitter. I admire that skill in the pro's, but I'm not there yet. I try to work out as much of the pattern as I can before casting on so I can try and pin point potential trouble spots before I get to them, but I find that I still have to actually knit the thing that I'm designing myself in order to iron out all the wrinkles. 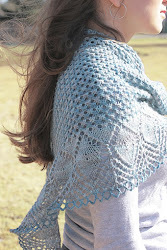 After knitting my mini-shawl I cast on for the larger, final version and it knit up without a hitch! So far, this system really works for me. 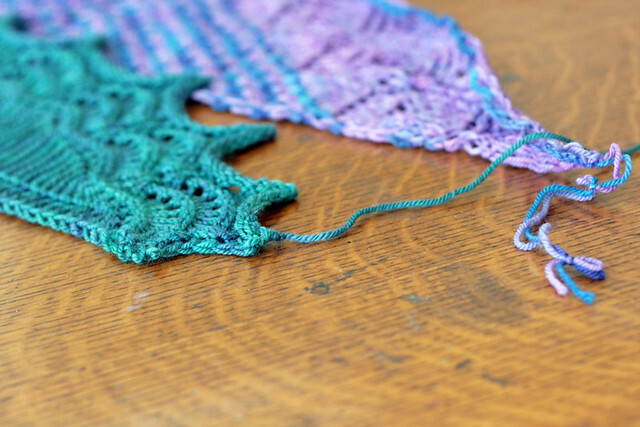 For me, it doesn't translate into garment design as I find that I really have to try things on as I go when I'm working on a sweater, but for a shawl, I'm loving the mini prototype approach. Caitlin L! aka: Goldilocks11. 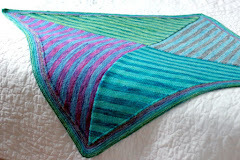 Congrats, I've sent you a message on Ravelry, your new niece is going to love her new blanket. Isn't it just the prettiest flower you've ever seen?